The Vaad Harabbonim/Rabbinical Council of Baltimore is teaming up with the Baltimore City Health Department and Sinai Hospital to host a free measles vaccination clinic. The clinic is scheduled for 10a.m. to 5 p.m. at the Congregation Shomrei Emunah at 6221 Greenspring Avenue. All adults 30-62 years of age are welcomed. "Please note that – especially in light of recent patterons of outrbeaks in other Orthodox communities, and because of the extensive travel and close contact between communities – we consider the entire Orthodox community at risk," read a quote from Vaad HaRobbonim of Baltimore on the flyer. 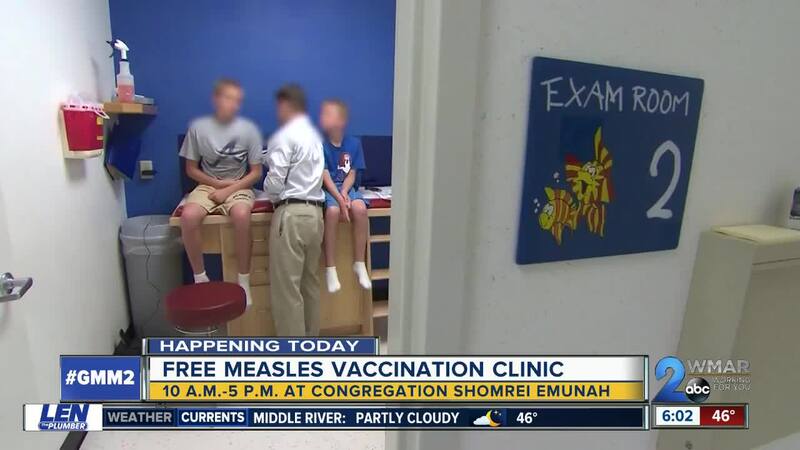 The Orthodox Jewish community is particularly considered as cases of measles have bee found within their communities or in areas where those communities reside. New York City declared a public health emergency in Brooklyn due to measles outbreaks. In the Baltimore area, people who passed through a certain area of Pikesville were warned of potential exposure to the disease. Local concerns about measles prompted LifeBridge Health to bar children younger than 14 from visiting facilities. Nationally, the number of measles cases continues to climb. Despite spreading concern, at least 20 states have proposed anti-vaccination laws. Concerns about vaccines are steeped in ill-informed conspiracies, misinformation, and long-since debunked science, as studies continue to show that immunizations, particularly the Measles-Mumps-Rubella vaccine used to thwart the disease, do not cause further health problems like autism. BALTIMORE — The Vaad Harabbonim/Rabbinical Council of Baltimore is teaming up with the Baltimore City Health Department and Sinai Hospital to host a free measles vaccination clinic. The clinic is scheduled for 10a.m. to 5 p.m. at the Congregation Shomrei Emunah at 6221 Greenspring Avenue. All adults 30-62 years of age are welcomed. "Please note that – especially in light of recent patterns of outbreaks in other Orthodox communities, and because of the extensive travel and close contact between communities – we consider the entire Orthodox community at risk," read a quote from Vaad HaRobbonim of Baltimore on the flyer. The Orthodox Jewish community is particularly considered as cases of measles have bee found within their communities or in areas where those communities reside. New York City declared a public health emergency in Brooklyn due to measles outbreaks. In the Baltimore area, people who passed through a certain area of Pikesville were warned of potential exposure to the disease. Local concerns about measles prompted LifeBridge Health to bar children younger than 14 from visiting facilities. Nationally, the n umber of measles cases continues to climb. Despite spreading concern, at least 20 states have proposed anti-vaccination laws. Concerns about vaccines are steeped in ill-informed conspiracies, misinformation, and long-since debunked science, as studies continue to show that immunizations, particularly the Measles-Mumps-Rubella vaccine used to thwart the disease, do not cause further health problems like autism.